Silver Forge Jewellery Shop and Studio is owned and run by me, Jo Dix. I have been making jewellery under the Silver Forge banner since 2005 but I started making jewellery long before that. 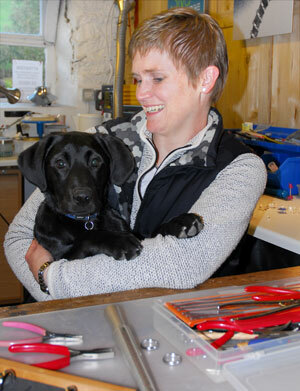 The shop is also manned by Izzi, the black lab and Happiness Officer. She keeps a careful eye on things and gives a gusto-welcome to anyone who visits. I love to experiment and have had wonderfully unusual jewellery commissions over the years. These have required special care and a lot of thought during the designing / making process. I am inspired by every day life, nature, industry, people, events… everything I see, hear and do influences my work. The shop may be closed on Monday and Tuesdays but this gives me time to make. On a busy day in the shop I often don’t get any making time due to commission briefings and queries from customers. The “closed days” are my chance to try and catch up. Of course, I also work in the evenings and outside of opening hours on weekends too – so there’s little time for anything else. Sadly, it’s more like 6.5 days a week, often 14hr days. I can only dream of that half-week job! I don’t want to create work that is the same as everyone else’s, preferring to produce individual pieces that are functional, easy to wear and distinctive. What does Silver Forge Jewellery do? I design and make jewellery with the intention of bringing pleasure to its new owner! As a maker-retailer I create stock items which are avaiable in the shop. Perfect for spoiling yourself, or someone else. I also offers these items at regional shows and various outlets in Cumbria. Much of my current work is commission based, designing and creating custom jewellery pieces for clients located all over the UK. I always love a challenge, and bringing to fruition someone else’s dream is a great feeling. Originally trained as a secondary school teacher, I have been running jewellery-making workshops since 2006, privately at my workshop and in the adult education sector. Beginners and more experienced participants are welcome on my workshops. I also create jewellery for men.